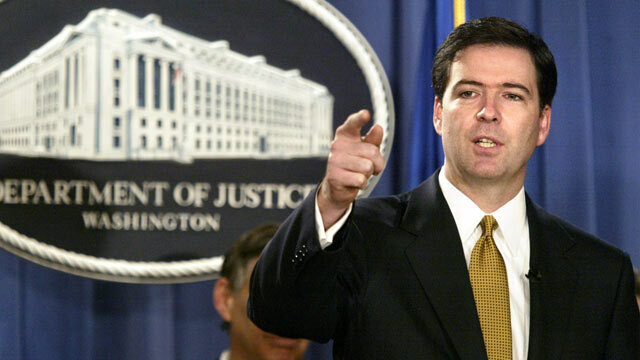 Deputy Attorney General James Comey gestures during a news conference in Washington, Jan. 14, 2004. James Comey, the man President Obama is likely to nominate as the new director of the Federal Bureau of Investigation, may be a Republican, but he's near and dear to the hearts of many liberals in Washington. The former Bush administration official became something of a folk hero for some of the most riveting congressional testimony in history. "As far as I'm concerned, when the Justice Department lost Jim Comey, it lost a towering figure," said Sen. Chuck Schumer, D-N.Y., during that congressional hearing in 2007. And when he said that, Schumer wasn't referring to Comey's 6'8 frame. In that testimony, Comey recounted how he, a deputy attorney general under John Ashcroft, rushed to his boss's hospital bedside to urge him not to sign an authorization for a classified domestic wiretapping program. At the time, Senate Democrats were investigating the Justice Department's activities, including the firing of Justice Department attorneys, and in the process of that investigation this now historic incident from 2004 was unearthed in cinematic detail. With Ashcroft in the intensive care unit in 2004, Comey was acting attorney general and he refused to sign the order re-authorizing the surveillance program which was set to expire within a few days. Then-White House counsel Alberto Gonzales, who later became attorney general, and White House Chief of Staff Andy Card went to Ashcroft's sick bed at George Washington Hospital in an apparent attempt to override Comey's decision. In his 2007 congressional testimony, years after leaving the Justice Department for the private sector, Comey said that he believed Gonzales and Card were attempting to do "an end-run around the acting attorney general." "And so I raced to the hospital room, entered. And Mrs. Ashcroft was standing by the hospital bed, Mr. Ashcroft was lying down in the bed, the room was darkened. And I immediately began speaking to him, trying to orient him as to time and place, and try to see if he could focus on what was happening, and it wasn't clear to me that he could. He seemed pretty bad off," Comey told Congress. "I was very upset. I was angry. I thought I just witnessed an effort to take advantage of a very sick man, who did not have the powers of the attorney general because they had been transferred to me," he added. That testimony became the lynchpin of the Democratic argument that Gonzales had engaged in "poor judgment and questionable actions," according to Sen. Diane Feinstein, D-Calif. And it precipitated a no-confidence vote against Gonzales in the Senate. "Comey obviously won a lot of points on the liberal side for the hospital episode," said Michael Tomasky a liberal columnist and editor in chief of Democracy magazine. But not everyone is ready to give Comey a pass for his involvement in Bush adminsitration counterterrorism policies. The American Civil Liberties Union said that though he deserves "credit" for "courageously" halting the reauthorization of a secret survaillance program, the Senate should still closely scrutinize his nomination. "As the second-highest ranked Justice Department official under John Ashcroft, Comey approved some of the worst abuses committed by the Bush administration," said Anthony D. Romero, executive director of the ACLU. "Specifically, the publicly available evidence indicates Comey signed off on enhanced interrogation techniques that constitute torture, including waterboarding. He also oversaw the indefinite detention without charge or trial of an American citizen picked up in the United States and then held for years in a military brig." And as a Republican who donated more than $7,500 to Republican Nominee Mitt Romney's presidential campaign in 2011 and 2012, and $2,300 to Arizona Senator John McCain's presidential bid in 2008, Senate Republicans may be hard pressed to put up a big fight against Comey's nomination. "He seems a shrewd choice in that Obama appears to have boxed [Senate Minority Leader Mitch] McConnell in and maybe decided to start playing some hardball," Tomasky added. But what also makes Comey's pick as FBI director a potentially smart move for Obama is that another major character in the hospital bed saga was the FBI's current Director Bob Mueller. Mueller also rushed to Ashcroft's bedside with Comey that night and the two men threatened to resign over the surveillance program kerfuffle. Back in 2007, Comey called Mueller "one of the finest people I've ever met." Mueller, who was nominated to lead the FBI by President George W. Bush in 2001, enjoys bi-partisan support in Congress. And President Obama liked him so much that he asked Congress to waive the FBI director's 10-year term limit to let Mueller serve an additional two years. Comey is also as close to an insider at the FBI as a relative outsider could be. As a former U.S. attorney who worked on terrorism, corruption, and organized crime cases in the 1990s, Comey has a history of working closely with FBI agents. If anything, he already has their trust, said Tim Murphy, the former deputy director of the FBI, who is now a vice president at MacAndrews & Forbes. "From FBI agents that I've spoken to, everybody is pleased that you have someone who has the law enforcement credentials – who was over at the Justice Department," Murphy told ABC News. "The integrity of Comey is pretty much unmatched with the exception of Director Mueller." Since leaving the Bush administration in 2005, Comey shuffled to the private sector working at Lockheed Martin, then the investment management firm Bridgewater Associates, then into academia at Columbia University Law School. And in that time, the fight against terrorism, and the FBI's role in that fight, has changed tremendously, Murphy said. "The terror threat is changing rapidly," said Murphy, who was deputy director at the FBI from 2010 to 2011. "My biggest concern is that he's got to get on that from day one. The terror threat has gone from identified al Qaeda members to today where it's an unknown threat." "These decisions are going to come at him fast and furious," Murphy said.